Anthony Bourdain had always been one of my idols. He inspired me to create my own show about the best restaurants in Richmond. Unfortunately, I quickly realized that I'm not cool enough to pull it off. You can see one of the results. I didn't want to give up on my love of food completely, so I decided to take after my favorite food writer, Tom Sietsema of the Washington Post, and write restaurant reviews. All of the restaurant ratings are based on a four star system. Like Tom, I rarely ever give 4/4 stars. You can't be too easy when you're a food critic. There are quite a few barbecue joints in Richmond. Alamo is the best. Fight me. Located in a quiet neighborhood in Church Hill, Alamo is a tiny barbecue stand with only outdoor seating. Though it doesn’t look like much, you know it’s going to be good the moment you open your car door because your mouth starts salivating. You can smell the smoker from blocks away. Alamo smokes all of its meat on site, twenty-four hours a day. Order your food at the counter, then wait on one of the benches or bright red picnic tables. Your name will be called through the window when your food is ready. Everything is served in styrofoam to-go boxes. The tables are shaded so you can eat right there, but right across the street is Jefferson Park. Walk up the hill, pick a bench, and you can eat your barbecue while looking out over the entire city of Richmond. I highly recommend it. Alamo serves Texas-style barbecue, which means it’s slow cooked and doused in sweet and tangy tomato-based sauce. From the smoker, they have pulled pork, pulled chicken, beef brisket, smoked sausage, and ribs. Order any of these in a platter or a sandwich with sides like Texas caviar, collard greens, and potato salad. They also serve a barbecue take on Tex-Mex where you can order any of the meats in a burrito, taco, or quesadilla. The Trainwreck Burrito is a tortilla filled with your choice of meat, jalapeño mac and cheese, cowboy beans, and cornbread. Of the meats, the pulled pork and the sausage are the best. The pulled pork is smokey and tender. The sausage is juicy and gives that satisfying bite in your mouth from the casing. The beef brisket, which Alamo advertises as award-winning, is rather tough, though the dark crust on the outside and the perfect pink smoke ring gives it a lot of flavor. The jalapeño mac and cheese provides a creamy balance to the tangy salty meats. The Texas caviar, a salad of black-eyed peas, black beans, corn, and green peppers, is refreshingly light. The cornbread, though, is a little dry. Everything tastes better when you get a little bit of meat and a little bit of a side on the fork together. Tacos are filled with your choice of meat or you can opt for blackened tilapia. They’re topped with coleslaw, cheddar jack cheese and Texas caviar. Messy and dripping with sauce, they’re a different take on tacos. If you’re looking for a portion that’s smaller than a platter and lighter than a sandwich, this is the way to go. Though the seating is only outdoors, Alamo is open year round, so you can get your barbecue fix anytime and take it home with you. Good thing I don’t live in the neighborhood, because the smell of the smoker would make me crave it every day. Mamma Zu might be one of the most talked about restaurants in Richmond. Any request for restaurant recommendations always gets an enthusiastic “Mamma Zu!” The rumors of bad service only add to the intrigue. The rudeness of the servers almost makes the food more authentic in the eyes of Mamma Zu lovers. If you want friendly service, they say, go to Olive Garden. Located in a quiet neighborhood in Oregon Hill, from the outside, Mamma Zu’s looks like an abandoned building. The paint on the wooden sign above the entrance is so worn off that it’s almost impossible to make out the scripted lettering. All windows have the shades drawn so there is no way for an onlooker to see that inside is a bustling restaurant. Once you open the wooden door and the screen door inside (make sure you shut it behind you or you’ll get glares from the patrons sitting by the door), the dining room is dimly lit with bright orange hues from the walls and from the candles at each table. We arrived right just after it opened for dinner, so the place was almost empty, with only a couple tables full and a few people sitting at the bar. There is no host stand, but the manager came up to us as we walked inside. Since only half of our party was there, he urged us to sit at the bar until everyone arrived. While we waited, we examined the menu, which is written on a chalkboard behind the bar. A few of the items has little x’s next to them, which meant they were all out. Diners should get acquainted with the menu before they sit down, because the only menu provided at the table is for drinks. If you want a glass of wine, the only options by the glass are one house red and one house white. Once our whole party arrived, we were seated right away. This is rare though. On another visit, the room was so packed it was impossible to find the manager to put our name in and the line was out the door. Even on this visit, by the time we left around 7:00pm, groups of people were standing in the middle of the restaurant waiting for a table, while a small child ran in and out of the front door. Contrary to the negative service hype, our waitress was friendly and helpful in answering questions. The menu doesn’t have any descriptions, so unless you want to stick to the classics like spaghetti with meatballs or eggplant parmigiana, you’ll have to ask what items like Penne Karl are (turns out, it’s just penne with mushrooms, garlic and olive oil). When one of our party asked for a suggestion for pasta with a tomato-based sauce and meat, our server suggested spaghetti all’Amatriciana, which ended up being the best of all the dishes we ordered. Described as a tomato sauce with caramelized onions and pancetta, the dish looked like a basic spaghetti with red sauce. But what it didn’t deliver on presentation, it did on flavor. Though it was difficult to taste the caramelized onions, the sauce had a depth of flavor and subtle sweetness. The pasta was cooked al dente (though that’s a minimal requirement for an authentic Italian spot), and the right amount of sauce to coat the pasta, but not weigh it down. The mild acidity of the tomato sauce brightened up the dish and the hints of parmesan cheese brought a warm nuttiness. Small, chopped up pieces of pancetta added a much craved textural element. Meaty and tender, they made you want to finish the whole plate. The orecchiette was a heaping plate of small, ear-shaped pasta that held the sauce like little bowls. The creamy, tomato-based sauce had hints of parmesan and a generous amount of ground sausage in every bite. Though the dish was hearty and spicy, the flavors were too one-note. The heaviness of the sauce craved a burst of acidity and the lack of variety in flavor or texture meant you got the idea after the first few bites and didn’t crave more. The spaghetti with spicy sausage and peppers was overwhelmed by the spiciness of the sausage. Though the peppers added a nice sweetness, the dish was uninspired. The carbonara was creamy and mild. The hints of pepper that flecked every bite added a warmth to the dish but neither the pepper nor the saltiness of the pancetta could help it from being rather bland. So, did Mamma Zu live up to the hype? In both categories, no. The service we experienced wasn’t rude, but the standard friendliness you’d expect from a restaurant. The food itself was technically well made, but the flavors didn’t wow. The bottom line: if the wait is too long at Mamma Zu, you can find an equally satisfactory Italian restaurant elsewhere. From the outside, Jamaica House doesn’t look like much. Right across from the VCU Siegel Center, you might not even notice it as you pass by. It sits right next to an ABC store and the sidewalk outside might have a broken bottle on the ground. But once you go inside, you’ll want to go back again and again. The chef, Lenworth Roper, has been cooking authentic Jamaican food since the restaurant opened in 1994. The restaurant only has four tables and you place your order up at the counter. Everything is served in to-go containers and most people opt to take their food home with them. Choosing to stay means you can settle down on the wooden bench that wraps around the restaurant and watch the line of people ordering. The walls are painted with brightly colored murals: a boat named Meanwhile docked on a golden beach on one side and a map of Jamaica on the other. The chalkboard behind the counter displays their menu. There are authentic Jamaican breakfast dishes served only on the weekend, like ackee and saltfish. Ackee, the buttery textured fruit that eats more like a vegetable, is boiled and sauteed with dehydrated salted cod. For lunch and dinner, if you’re feeling more adventurous, there’s oxtail and cow foot. But offerings also include jerk chicken, stewed beef and curry shrimp. Plates are available in both large and small sizes. Served with cabbage and rice and peas, the small plate is plenty for one person. But get there early, because some of the most popular dishes like curry goat and beef patties run out by dinnertime. Beef stew, which sounds less exciting compared to some of the other dishes, is one of the tastiest options on the menu. The beef is fork tender. The potatoes are hardy and fall apart in your mouth while the carrots add a subtle sweetness. The rice and peas soak up the rich gravy and the braised cabbage has a subtle crunch. When most of us think of jerk chicken, it’s a dry piece of boneless white meat with a spice rub. Jamaica House jerk chicken is served with white meat and dark meat on the bone. It’s cooked in a rich jerk sauce that warms your whole mouth. The spices are deep and almost chocolatey like a mole. The meat is so tender it falls right of the bone with every forkful. Even the white meat is juicy. Unfortunately, vegetarian options are almost nonexistent. The only option on the menu is a vegetable patty: a dense pastry pocket filled with carrots, onions, cabbage and potatoes in a savory gravy. One can order it with coco bread, a slightly sweet, pillow soft roll (but don’t expect it to taste like coconut -- it’s not supposed to). It’s tasty, but just not as delicious as the options meat-eaters get to enjoy. Jamaica House is a gem hidden in plain sight. A hole in the wall on one of the busiest streets in town, you can expect a hearty meal that warms you up and tastes like it’s welcoming you home. Oh, Stella’s. So hard to get a reservation, yet so worth it. The modern Greek restaurant in Scott’s Addition is almost always busy, but for good reason. The sophisticated dishes boast traditional Greek flavors with fresh interpretations. The restaurant is small, but bright and open. A long communal table sits in the center and handmade pottery lines a shelf above the bar. The staff is friendly and knowledgeable, giving recommendations and answering questions about the Greek ingredients and the list of wines. Soft, freshly baked bread is served to every table with a bottle of extra virgin olive oil that you pour yourself and top with freshly ground pepper and salt. The menu offers meze (small plates) if you want to get a little of everything and share. But it also includes entree sized portions of comfort foods like moussaka, as well as meats and seafood like leg of lamb and whole grilled fish. Vegetarians are not forgotten here. There are plenty of meatless options, all of which hold their own in flavor. One of these options is saganaki. A plate of melted kefalograviera cheese arrives to the table in flames. Half a lemon is squeezed on top and triangles of grilled pita are used as a smoky vehicle. Salty and mild, the middle is gooey with the perfect cheese pull, while the edges are brown and crispy. The acid from the lemon counters the saltiness, though I couldn’t help wanting little bit of sweet, like a little drizzle of honey, to add more contrast. Another meze is keftedes, pan fried beef and lamb meatballs. They come to the table covered in grated cheese. While the outside is nicely seared, the inside is fall apart tender and moist. Fresh mint adds brightness to the hardy flavors. A special of spanakopita strifti is served over potato wedges with a fried egg on top. The spinach and feta pie is spiraled, unlike the traditional squares or triangles you tend to think of. Each bite is packed with fresh dill and mint, while the flakiness of the phyllo dough gives a wonderful crispy texture. The richness of the runny yoke with the creaminess of the tzatziki makes the dish even more decadent. Every dish at Stella’s is made with care and attention to detail. If you can’t get a reservation at your ideal time, snag that 9:00pm. In Greece that’s prime dinner time anyway. I have a confession. I was never much of a pie fan. The crust is usually flavorless and soggy, the filling too sweet, too syrupy, or too gelatinous. When given the choice, I’d always choose any other option. But then I went to Proper Pie. Proper Pie is a New Zealand-style pie shop in Church Hill that makes both sweet and savory pies. When you walk in, the first thing you see is a mural of the New Zealand map on a bright turquoise wall. But as soon as you step up to the counter, you are greeted with the most decadent pies all lined up behind a glass case. It’s hard not to press your face up against it to get a better look. Pies are made fresh every day and flavors are constantly changing. If you want to find out what they’re offering that day, their menu is posted on their Facebook page every morning. Sweet pies are served by the slice and savory meat and vegetable pies are individually portioned. There are always vegan options and New Zealand treats like bright pink lamingtons dusted in coconut and sweet, nutty Anzac Biscuits. The savory pies are buttery and flakey. Fillings range from savory mince and cheese to Thai butternut curry. No forks and knives for these pies: hold it in your hand, take a bite, and watch the steam pour out. The pork and peach pie is sweet and tangy and the jerk chicken is surprisingly homey, like a chicken pot pie with a kick. The butter chicken pie was rich and decadent, but could have used more chicken to the amount of sauce. Sweet pies include traditional varieties like apple and pecan, but Proper Pie also gets creative: buttermilk & raspberry, meyer lemon, ginger & blackberry, and coffee toffee cream and just some of their rotating flavors. On the traditional side, the lemon meringue pie is gigantic. The lemon curd has the right amount of tartness and the light clouds of meringue are piled high. Coconut cream pie is creamy and mild, almost refreshing. The nuttiness of the toasted coconut on top adds a hint of sweetness. Campfire pie, which I thought would be too sweet, was my absolute favorite. Thick, fudgy dark chocolate filling, preline for a bit of crunch, and a sticky layer of whipped toasted marshmallow was one of the best desserts I ate all year. A close runner up is the banoffee pie. Caramelized bananas with a layer of cream and a dusting of bitter cocoa on top is pretty close to heaven on a plate. Proper Pie is the epitome of taking one thing and doing it really, really well. For those who already love pie, you’ve never had one quite like this before. And for those like me, who were never a fan, you will be converted. God’s work, my friends. Kuba Kuba is known for being a great Cuban restaurant right in the Fan District. But they’re best kept secret is their hot sauce. Well, it’s not their hot sauce. It’s René’s hot sauce. René works at Kuba Kuba. His nickname is Rana which means frog, so he named it Rana’s Hot Sauce and put a little green frog on the label. The hot, sweet, slightly acidic hot sauce has a big punch of heat, but keeps you wanting more. If I drowned in it I would die happy. When I told the waiter how much I enjoyed the hot sauce, René came over to talk about how it came about. René is from Mexico and realized he didn’t like the hot sauces commonly used in the States. So he started experimenting with different peppers and different flavors. That’s when he made Rana’s Hot Sauce with mangos, carrots, and habanero. He brought it in for the staff at Kuba Kuba to try. They loved it, so he continued to bring it in for them. One day, someone accidentally left the sauce out on the table and one of the customers tried it. They loved it too, so now he makes it for the entire restaurant. Every table has a bottle of Rana’s Hot Sauce and there are also bottles for customers to purchase (but make sure you bring cash). Beyond the hot sauce, Kuba Kuba serves some of the best Cuban food around. No matter what you get, always order a plate of platanos. It doesn’t matter that they come with a lot of the meals; you’ll always want more. The fried sweet plantains, soft on the inside and perfectly caramelized on the outside, are addictive. Spanish tortillas are as big as your dinner plate. 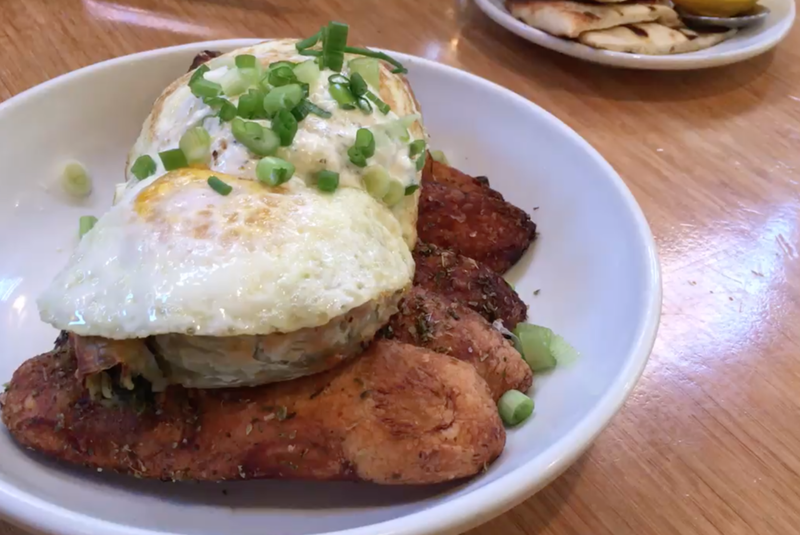 The fluffy eggs with potatoes, peppers and onions are delicious on their own, but you can choose variations like roasted red pepper and asparagus, chorizo, or smoked salmon. The Kuban Roast Pork is slow cooked and shredded. Slightly citrusy, I found a bay leaf in the middle which had been slow roasted with the meat. Served with mango pico de gallo, rice, beans, platanos, and cornbread, it’s a hardy meal. Though the waiter said the Kuban Roast Pork is one of their famous dishes, the Ropa Vieja outshines it. The shredded beef served over rice is tender and soaked in broth, almost like a stew. Full of flavor with hints of tomato, garlic, and onion, it’s the ultimate comfort food. For lunch, opt for the sandwiches served on toasted Cuban bread. The Cuban sandwich is a solid choice, or try one of the more creative options like the bar-b-quban. The shredded roast pork is smothered in a sweet and tangy barbecue sauce and topped with a fresh carrot ginger slaw. Kuba Kuba doesn’t accept reservations, but it’s well worth the wait. The spicy, sweet, bright flavors transport you to another place. Just don’t forget the hot sauce. You don’t have to be Jewish to love… Perly’s? Even though my non-Jewish dinner companions didn’t know how to pronounce knish or or kugel, they couldn’t get enough of this Jewish delicatessen tucked away on Broad Street. Dinner started with matzo ball soup. As big as a softball, the matzo ball was light and airy. Sprinkled with fresh dill, the broth was clear, yet flavorful, with pulled pieces of boiled chicken, tender diced onion, large rounds of bright orange carrot, and half moons of celery. Potato latkes followed the soup. Perfectly crispy on the outside and soft in the middle, they were placed on a layer of sour cream and topped with a apricot puree, a surprising deviation from the traditional applesauce. The salty sweet combination topped with fresh, bright green chives were my dinner companion’s favorite of all the dishes. Knishes, little meat, potato, or vegetable filled pastries, were a snack I grew up with; a treat my parents brought home from the Kosher butchery every few months. Perly’s meat and potato knish was huge, about the size of a hand pie. Inside, the stuffing was under seasoned with too much potato with not enough ground meat. However, the warm pickled cabbage that came on the side more than made up for the lackluster knish. Vibrant purple, the sweetness filled your palate then finished with a tart bite of vinegar. Perly’s has a wide variety of sandwiches, from corn beef on rye to pastrami and chicken liver. The Jewbano tasted like a cuban with strong spicy mustard and sliced brisket and tongue. The Shapiro Schnitzel sandwich was another home run. Fried breaded chicken pounded thin was tucked between toasted pieces of challah with pickled cauliflower that brightened up the whole sandwich. On the way out the door, we passed a glass case filled with smoked fish and a variety of pickles. Large whole fish smoked and dried, a plate of sardines, and pink, delicate slices of lox were displayed. On the top two shelves were a variety of house-pickles: bright purple pickled eggs, yellow spiced cauliflower, dark cubes of crimson beets, and vibrant purple cabbage. Lots more to try on the next trip, we decided. Having grown up in New England, I didn’t experience real Southern comfort food until after college. But once I learned how mac and cheese tastes when it’s not from the box and how sweet sweet tea really is, I was hooked. Mama J’s is known as one of the best Southern comfort restaurants in Richmond. Mama J is named for Velma Johnson, the matriarch of the family owned restaurant, who was born and raised in Richmond. She developed the recipes served at Mama J’s from her childhood of cooking with her mother and grandmother. Her eldest son opened the restaurant with his best friend in 2009 to help facilitate the redevelopment of Jackson Ward, a historically black neighborhood. Walking to Mama J’s, you’ll see some of Richmond’s stunning murals with bright pops of yellows, pinks, and greens. The restaurant’s decor fits right in, with bright yellow and orange walls. Everything has character and a personality. The hostess stand has Welcome Home in wooden letters across the front and the sign over the kitchen says simply Home. A framed picture on the wall by the door says, If you don’t vote, you don’t care! November 7, 2017. To the left of the bar, frosted pink and white cakes are temptingly displayed on silver cake stands. The menu has all the Southern comfort classics. Fried chicken, pork chops, candied yams, and macaroni and cheese are some of the items starred as Mama J’s favorites. Wash it all down with sweet tea and you’ll never want to leave the South again. I love fish, but the first time I tried catfish, I was not a fan. It was dry, with a strong fishy flavor. I wasn’t sure how I’d like the fried catfish at Mama J’s, but it ended up being my favorite item on the menu. The fish was fresh and flakey. The batter was light, just enough to keep the fish moist and give a nice crispy outside. Perfectly seasoned on its own, it didn’t even need the rémoulade and tartar sauce served on the side. The fried chicken was juicy with a satisfying crunch. But the collard greens were a little too salty and the mashed potatoes a little too smooth. They lacked the homemade feel that you get from the rest of the dishes, though the gravy was dark and flavorful. The macaroni and cheese was rich and creamy. The cornbread, which often can be dry, was moist and buttery. Crab cakes have big pieces of crab with not much filler. Light with a nice crust on the outside, they were a surprisingly good find. Mama J’s doesn’t skimp on servings and the food is so rich and filling, you’ll want to go home and take a nap afterwards. When the bill comes, you’ll be surprised how much food you got for such a low price tag. With your stomach full and satisfied, Mama J’s makes you feel like you were just treated to a family’s home cooked meal. 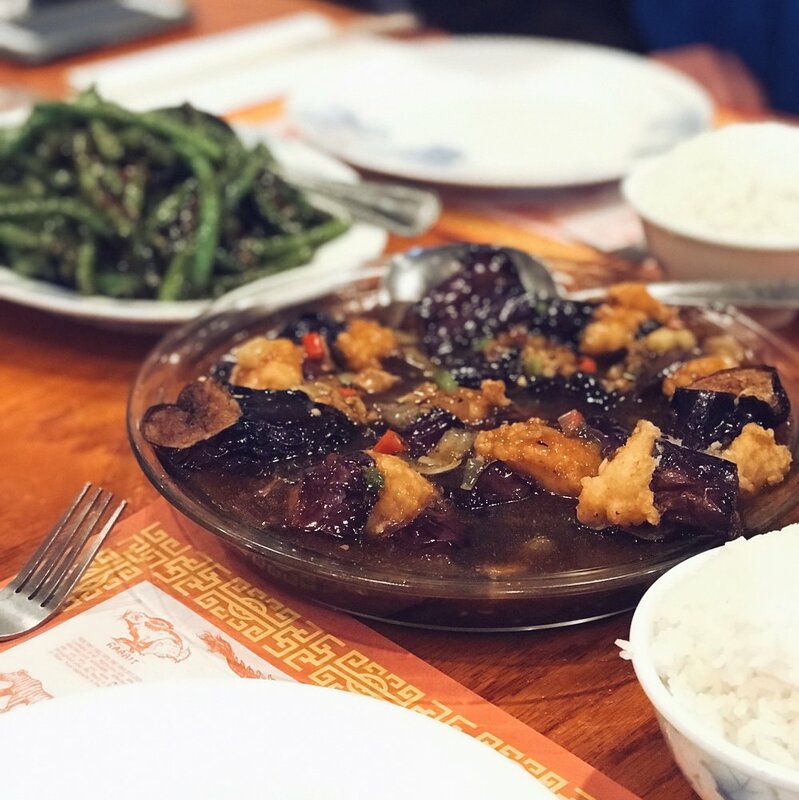 When you think of the best Chinese cuisine in Richmond, most people think of the award-winning Peter Chang’s (not to be confused with the chain, P.F. Chang’s, which is quite different). But there’s another Chinese restaurant that should be put on the map. While Peter Chang does his own take on Szechuan style food, Full Kee specializes in Cantonese. Though the restaurant is located west of Richmond, it is well worth the 20 minute drive. When you walk inside, to the right is a glass case with hanging meat: whole roast duck, crispy and golden, a length of bright red Cantonese barbecue pork, and sometimes octopus. A handwritten list in Chinese characters indicates the prices of the meat if you want to buy them by the pound to bring home. Live lobsters are in tanks along the wall. The menu includes a lot of familiar fare, like kung pao chicken, sweet and sour pork, and lo mein. But they also serve more traditional dishes like stir-fried frog, duck tongue, or boneless duck feet, all prepared with green peppers and black bean sauce. After seeing the hanging roast duck, it will probably be the first thing you’ll want to order. You can get a quarter duck as an appetizer portion or half roast duck as a dinner portion. The skin is crispy, the meat fatty and flavorful. Salty juices are spooned on top, which you’ll want to sop up in every bite. The one problem is that it is very difficult to eat, as the duck is cut into pieces with the bones. The small bones are particularly difficult to eat around, especially with only a butterknife, so you may get frustrated and want to pick it up with your hands. The casseroles on the menu are not what Americans think of casseroles. Instead, meat and vegetables in a mild sauce are served in a hot cast iron pot. We ordered the assorted meats and seafood with fried bean curd casserole. It came with chicken, squid, chinese mushrooms, scallops, fish balls, fried tofu, and slices of the barbecue pork we saw hanging in the front of the restaurant. The fish balls, like meatballs, are ground fish formed into a slightly chewy ball. The barbecue pork was the highlight of the dish. Salty and slightly sweet, I wanted to search through the rest of the pot for more. Stuffed eggplant with shrimp paste in black bean sauce came highly recommended and was one of the best dishes of the night. The tender chinese eggplant was sliced and served with minced shrimp on top. The shrimp is slightly nutty, as if it had been quickly fried in sesame oil. The sauce was flavored with scallions and mouth warming ginger. An expert in simplicity and fresh ingredients, Full Kee uses traditional methods to make its food shine. The trick is to bring a large group of friends, so you can snag one of the large round tables with the Lazy Susan and share as many dishes as you can.